The result again only shows one driver's name for each car, but Soheil Ayari and Bruno Hernandez won at Le Mans again on Sunday. PSI contined its good form: third and fifth on Saturday was followed by second and third on Sunday. The 'electronically-restricted' Larbre Ferrari finished seventh in the hands of Gardel / Dupard, two places behind the regular Larbre entry. Full report to come. 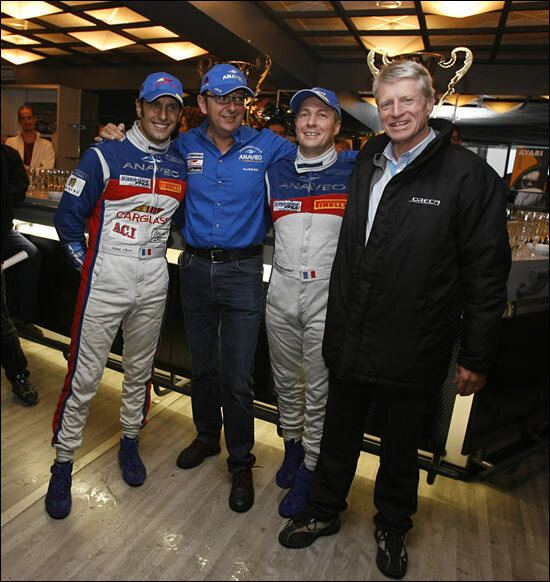 That's Oreca's Pierre Dieudonne on the right. With seven wins, Ayari and Hernandez are the FFSA GT1 Champions, with two races left - at Magny-Cours in a week's time.